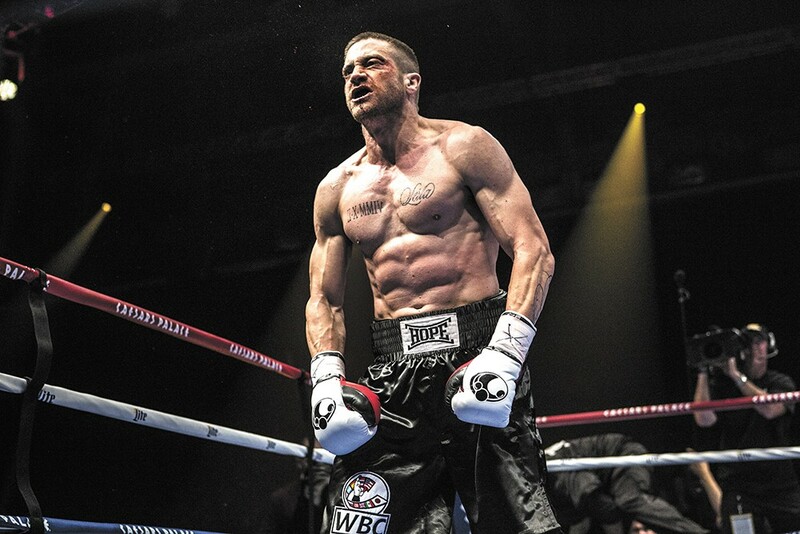 Jake Gyllenhaal takes a swing at an Oscar in Southpaw. Thanks to Rocky, we all know how the story's supposed to roll in a boxing drama about a guy from the streets getting a title shot. The scrappy underdog, lacking the resources of his rival, has to make do with an old, never-quite-a-contender trainer who has the fighter punching meat, or whatever new equivalent a screenwriter can come up with. Maybe there's a girlfriend — or a mother, or some other family member — to fret over whether the focus on making it to the top is distracting him from important things like his health. They're economic fairy tales, of a sort — visceral variations on an American tale of up-by-the-bootstraps success, where their bodies are the only currency they have to put in the game. Southpaw — written by Sons of Anarchy creator Kurt Sutter and directed by Antoine Fuqua (Training Day) — starts in a place that seems counterintuitive. Billy Hope (Jake Gyllenhaal), a kid from Hell's Kitchen raised in the foster care system, is already the undisputed, undefeated light heavyweight champion of the world when the film begins. He's happily married to similarly up-from-the-'hood Maureen (Rachel McAdams), with a 10-year-old daughter, Leila (Oona Laurence), living a dream life in a mansion. There's no rags-to-riches story possible here; if not for Jim Lampley providing an improbable level of ringside exposition about not just the fighter but his wife, we wouldn't even know there had ever been rags. But there's a shake-up on the way in Billy's life. A sudden tragedy — captured with an emotional intensity that left me holding my breath, so I'll be damned if I'm gonna spill the beans, even if trailers have already done so — leaves Billy reeling. And there's no escaping the realization that he was the one responsible. That's when it becomes clear that Sutter and Fuqua are taking Southpaw in a surprising direction. It turns into the story of someone whose career success didn't change the quality that most threatens his long-term chances for happiness. Southpaw is going to have to break Billy Hope down again in order to have him build himself back up the right way. Structurally, there's a battle going on in Southpaw between the familiar sports drama it seems to be working against, and its unique character arc. It's still a movie in which the down-and-out Billy finds that old trainer — gym manager "Tick" Wills (Forest Whitaker) — and it still gives us an old-school training montage on the way to the Big Fight, as a bankrupt Billy considers a big payday to face the new champ (Miguel Gomez). Individual moments and snippets of dialogue make it feel as though Fuqua almost should've committed to pure melodrama, rather than gritty edginess. Maybe the goal is providing a pure crowd-pleaser; maybe it's delivering something more complicated. Maybe it doesn't always work, as Southpaw tries to tiptoe through the space between the two. Gyllenhaal, though, finds yet another reservoir of intensity for a tricky role, much as he did for last year's Nightcrawler. Billy's defining trait as a fighter is his refusal to defend himself — proving to himself that he can take any kind of punishment before his bottled rage takes over — and Gyllenhaal shows us the consequences in both emotional and physical form. His chiseled body may draw attention — the way it always seems to happen when an actor transforms him or herself physically — but he's just as good at the subtle slurring of a guy who's taken a lot of punches to the head, and the residual psychic damage of an early life dependent on never backing down from a challenge to your manhood, even if there are always consequences.